Central Market isn’t a secret at all, but free live music isn’t something people expect from a high-end grocery store. Still, hundreds gather every Friday and Saturday night from March through October to listen to Fort Worth music acts that vary from great to poor in quality and cover many musical genres. While the idea of a grocery store as a music venue takes some getting used to, I’ve listened to more live music at Central Market than anywhere else. That’s because the price is right, the atmosphere is fun, the regulars are generally agreeable people and many of the bands are top quality. The Fort Worth Central Market has offered live music for more than a decade, since shortly after the opening of the store in 2001. The massive patio — one of the largest in town — along with the ample parking and the convenient location make it a natural live music venue that draws listeners from all over the city and beyond. The connection between the Central Market brand and live music goes back even further. The original Central Market location in Austin opened in 1994 and also has a generous patio with an adjoining private park. 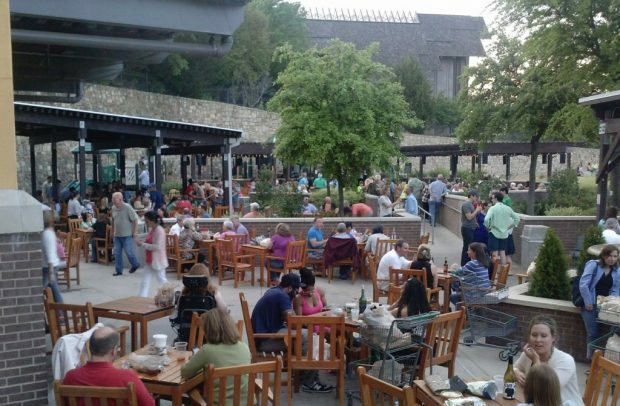 Other locations in the chain feature music, too, but the original Austin location and the Fort Worth location are the only ones with large, accommodating patios that draw in big crowds. Central Market is a high-end chain from H-E-B, a grocery store company with a long history in Central Texas that has only recently brought its large and impressive H-E-B grocery stores to the Dallas-Fort Worth market. The idea behind Central Market is to provide an upscale grocery experience and upscale take-home food as well as classes and other amenities that draw people to the stores. There are now nine locations, all in major Texas cities. Bands at Central Market Fort Worth play most Fridays and Saturdays in March through October, usually from 6 p.m. to 9 p.m.
I’m a regular for the free live music concerts at Central Market and have been for many years. The quality and type of music provided has varied considerably through the years. Things seems stable these days, however, with more good bands than bad. There’s also more variety that in some years. Crowds got large and out of control in years past, and management stopped booking some audience favorites, opting instead for solo acts and acoustic groups in an effort to limit attendance. Imagine that: a venue trying to keep guests willing to shell out for food and drinks away. Fortunately, saner ideas prevailed and management is once again booking a good mix of bands. To make the most of your Central Market live music experience in Fort Worth, watch the store’s online events calendar to help you decide what nights to visit, then call ahead to make sure the announced band is actually performing. Last-minute schedule changes and weather-related cancellations are common. Be sure to check out bands you don’t know much about by seeing if they’re popular on Facebook and looking at some YouTube clips or listening to some MP3s on the band website, if there is one. Remember that arriving early is essential if you want a seat on the main patio section near the stage. Many guests arrive before 4:30 p.m. Some seasons, I’ve had strong negative feelings about Central Market because I’ve made the mistake of taking a personal interest in this venue. Many assurances to me have turned out to be just so much talk, but the live music at this grocery store has been an overwhelmingly positive part of my life in recent years — and one that I miss when it occasionally flakes out. It’s impossible to overstress the importance of arriving early. The best tables are almost always gone by 5 p.m., and crowds come even earlier on the best evenings. If it’s cold or excessively hot, however, few people show up even if the music goes on. Bring a cushion of some kind because the wooden chairs are uncomfortable for many. I get around the discomfort by sitting on a towel — and standing up a lot! Outside food and drink is prohibited, but this is a grocery store and café, after all. Coolers are also prohibited. Prices for food and drinks are generally expensive, but there are some affordable choices, like a one-price fountain drink you can refill all night, child’s spaghetti, macaroni and cheese and sandwich meals and relatively inexpensive chips, bulk dips and fresh-made breads. Most prepared foods are served chilled, so make your selection early enough to take advantage of the microwaves inside. When the patio is full, try the second-floor balcony. There’s also an inside dining room upstairs with a microwave and the best free wifi reception in the store.